Semeru volcano has elevation at 3,676 meters above sea level this volcano is one of the most active volcano in Indonesia located in Mt Bromo Semeru National Park. Every season most visitors from all the world like Asia and Europe tourist have tried the trekking and reach the summit successfully. 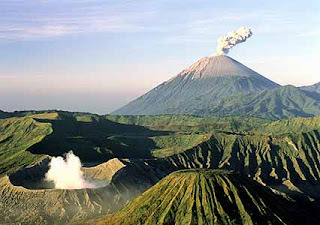 The best time to book Semeru trekking tour 4 Days is on May - November annually, In this month normally the weather is good. Our tour driver will pick you up using private Air conditioned transportation in Surabaya or Malang Airport, then take you to your homestay around Ranu Pane village for 5 hours, Reach the homestay, Stay 1 night. Along hiking route, you can enjoy the view of Mt Argopuro. Arrive at Ranu Kumbolo in afternoon, then having lunch and relax. After you get the Kalimati village, stay half nights by camp to take full energy before climb to the summit, suggested to have a good sleep. Finish Semeru volcano summit trekking, comeback to Kalimati camp to have breakfast and to rest enoughly. Continue trekking down to make Kumbolo Lake Camping and stay 1 night included time for dinner. If the sky is clear You will able see Milky Way from Kumbolo lake like Milky Way at Mount Bromo. Comeback to Ranu Pane village using different route via Ayek - Ayek slope. 02.00 - 03.00 PM, Raech the Ranu Pane (parking lot), comeback to Surabaya (Airport or Hotel) for 6 hours and finish Mount Semeru Trekking Tour Package 4 Days. Before You start Mount Semeru Trekking Tour Package 4 Days, I hope You prepare complete clothes like trekking pole, trekking shoes, gloves, hat, long pants & headlamp, in Order You can adapt with steep route and cold temperature on Mount Semeru summit.